Blink twice and you might miss Birmingham’s latest homegrown music and arts hub. A nondescript brick storefront labeled “JBIRD” is the only curbside cue to stop. Located off Fifth Avenue South in the Crestwood neighborhood, The Jaybird is an eclectic space that doesn’t fit neatly into any category. With books spanning several genres and abstract art lining the walls, The Jaybird is a colorful sight that champions inclusivity. Burgin Mathews, who manages the venue alongside his wife Glory McLaughlin and friends Lillis Taylor and Lloyd Bricken, says the idea for The Jaybird was born in a spontaneous fashion. Burgin, who also hosts Birmingham Mountain Radio’s “Lost Child” — a one-hour Saturday morning segment that features a soulful blend of old-school honky-tonk, authentic Zydeco, crackling jazz and old-time fiddle and banjo tunes from the vault — unknowingly came up with the idea for The Jaybird a few years back when he wrote a lengthy post on Facebook describing a space that would house books and music, but also serve as a live music venue welcoming the kind of artists he felt lacked a home in Birmingham. To Burgin’s surprise, his musings struck a chord with his friends, who eventually persuaded him to turn the dream into reality. Two years later, Lillis, a mutual friend of Burgin and Glory who owns Bib & Tucker Sew-Op, a local nonprofit, mentioned that a space had become available in her building off Fifth Avenue South. She and Lloyd mentioned the vacancy to Burgin, insisting it would be the perfect location for his dream. Two months later, The Jaybird opened its doors, welcoming hundreds of visitors on its opening day. The goal of the space, Glory says, is to champion inclusivity by welcoming people of all backgrounds. “We want to be intentional in inviting people whose paths might not cross otherwise,” she says. And since opening in September, Burgin says he, Glory, Lillis and Lloyd — Lillis’ husband and active event planner at The Jaybird — have been overwhelmed by the community’s response to the space. By unconventional and nontraditional, Burgin means that it’s hard to categorize The Jaybird — yet its art-forward gatherings seem to draw enthusiastic visitors from all walks of life. Some weekends, the space comes alive with toe-tapping bluegrass music featuring nostalgic covers of George Jones, Loretta Lynn and Conway Twitty. Other nights, the floor clears for old-time 1930s swing music that takes over the space and unabashedly fills the small stage that sits at the front of the venue. Since setting up shop, The Jaybird has consistently hosted live music once a month — usually on the second Friday — and an art opening every other month. 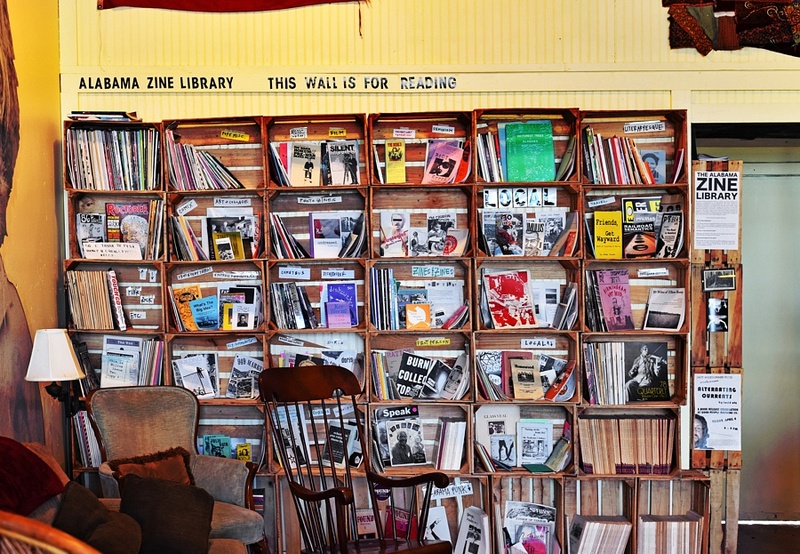 On Saturdays, the space is open, offering coffee shop-style service, from 11 a.m. to 4 p.m. for those looking to peruse the venue’s book selection, which includes a wide array of titles along with handpicked self-published books and “’zines” that The Jaybird curates. On Sunday from 4:30 p.m. to 5:30 p.m., The Jaybird turns into a temporary yoga studio for anyone looking to get a good stretch and find some reprieve. As for The Jaybird’s name, Glory says she can’t pinpoint its exact origins other than that it was one that all four founders liked. “When the four of us were thinking of a name, we threw out lots of suggestions, and that was one that stuck,” she shares. However, Glory says, sometime after solidifying The Jaybird name, the foursome realized “Jaybird” was also the name of an Alabama blues musician, Jaybird Coleman. He recorded several songs in the 1920s and 1930s and performed at regional minstrels, making appearances throughout the South. The Jaybird now proudly displays a portrait of the musician on its walls — serving as a reverent and soulful nod to the style of music and art The Jaybird champions. Every Birminghamian and lover of music, art and literature interested in enriching the rich cultural fabric and ideals of inclusivity in our great city should head to this one-of-a-kind gem soon. The Jaybird is located at 4911 Fifth Ave. S., Birmingham, AL 35222. Hours are Saturday, 11 a.m to 4 p.m. for perusing the books and grabbing a cup of coffee, and Sundays, 4:30 p.m. to 5:30 p.m. for yoga. To catch a live music show, jam session, poetry reading, art exhibit, craft show, food truck, pop-up brunch and more, check their calendar of events. For more information, email info@jaybirdalabama.com or visit jaybirdalabama.com.